In this tutorial, you will learn how to add a bookmark in Microsoft PowerPoint 2010. No one wants to create a dull and boring presentation. Microsoft PowerPoint 2010 is packed with many good features that allow users to deliver content in a captivating manner. Take for instance, videos on a slide. You may want to discuss a particular point on the video while it is playing. PowerPoint allows you to insert a bookmark inside the video file for that purpose. You can then set a trigger to link the bookmark to another action. For example, you can set an animation effect to be triggered at a certain bookmark. This way, you can make your video presentations interesting and interactive. In this tutorial, you will learn how to add a bookmark in Microsoft PowerPoint 2010. You can add a bookmark by selecting the Add Bookmark command in the Bookmarks group on the Playback contextual tab, in the Video Tools contextual tool tab. 1. Display the slide with the video to which you want to add the bookmark. 2. On the video, click Play. 3. When the video reaches a point where you want to set the bookmark, select the Playback contextual tab and in the Bookmarks group, click Add Bookmark. Observe that a small bookmark point is placed in the video play bar indicating that a bookmark is placed in the video. If you wish to reuse your video slide and the bookmarks you created are no longer relevant, you can just as easily remove the bookmarks. Here’s how you do it. 1. Navigate to the slide containing the video file that was bookmarked. 2. 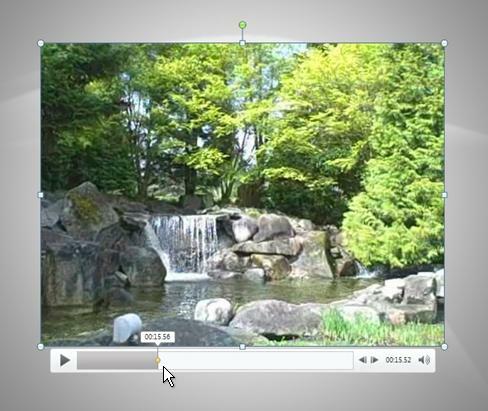 On the Video Tools Playback contextual tab, in the Bookmarks group, click Remove Bookmark. Now you know one more interesting feature in PowerPoint 2010 that you can try out the next time you work on a presentation. If you found this tutorial useful, be sure to check out our Learn PowerPoint series for more useful tutorials.